Paese Cosmetics now offered on Cloud 10 Beauty - huzzah! Remember Paese Cosmetics? I told you about them here, and I bought and reviewed a few more products over here, too. I was super impressed with the price and quality of this award winning Polish brand, but considerably less happy that we couldn’t easily get our hands on the products. Well, today is a happy day. 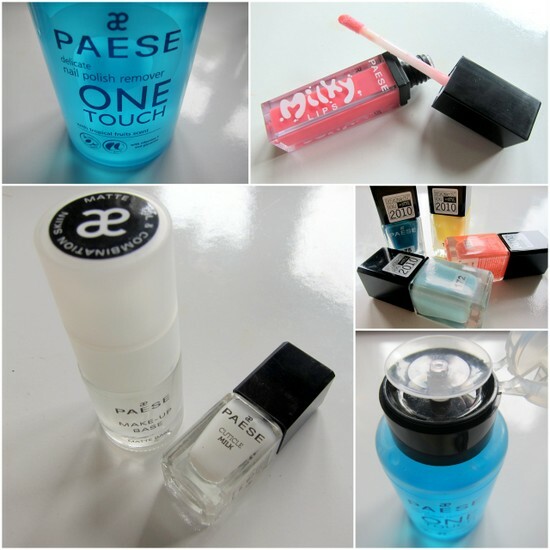 Cloud 10 Beauty, a brilliant Irish online beauty boutique, are now stocking a fab range of great Paese products, from primers to polishes and gloss. Their primers rival those of many high-end brands and I really like their Milky Lips - these are nice hydrating glosses, that are quite long-lasting. They're offered in 8 shades on the Cloud 10 site, for €4.50. I can also recommend the nail products, having tried quite a few – some of which I bought, and some of which were sent to me by the brand. The polishes, €3 each, go on smoothly and dry to a really glossy finish. There’s a huge range of colours – Cloud 10 have 16 shades at the moment, which I hope will be extended. I’d love to see them stock the pretty pastel shimmers (like mine, in these pics) and some of the gorgeous glitters that are offered by the brand. I’m a fan of their nail polish remover, too – with its one-touch system it’s convenient, and a little goes a really long way. Plus, it’s €3.50 – you can’t really argue with that. These are good quality products at excellent price points and the service from Cloud 10 is second to none, so go on, head on over and check out what they’re offering. Is a cheeky wee Friday purchase on the cards? Wow! I can't believe the prices, love the packaging too! This brand is new to me and I'm always on the look-out for new glosses and nail polish. It seems very reasonably priced too yet the packaging doesn't look cheap. Hi! We just discovered your blogand it is amazing, we love it so much! Great prices - and they look very tempting too. Hi dear, you always find the best brands, i like the chic and clean packaging of these. Happy Weekend ! My sis is addicted to this eyeshadows: http://www.sklep.paese.pl/23-diament-mono.html I have one and they are great, have very good pigmentation.The only disadvantage i see is pearl finish. If you like matt shadows this product is not for you. Ohh I wish this was carried in the states! The nail polish remover looks amazing. It was a short trip (only 5 days), and I was only in Dublin and Galway. I would very very much like to return, and hopefully for a bit longer next time! Nicely designed products and they seem very affordable too. This is why I like reading your blog, because I learn about products I've never heard of. HaHa Glad you're able to easily get them now. They look great. One of the best things about your blog is learning about all of the brands I have never heard of. I want to try the Milky Lips. Never heard of them, but definately going to check it out - fan of your blog! oh it looks so good! I need to get me some, I love that you introduce us to the coolest things!